JFR’s revised lineup _ minus Courtney Force in Funny Car _ will feature three fulltime hot rods along with a fourth contingency team for development driver Austin Prock. Preseason testing is scheduled to begin Wednesday, Jan. 30, and continue through Feb. 2 at Wild Horse Pass Motorsports Park in Chandler, Ariz. The 2019 NHRA Mello Yello Drag Racing Series season will kick-off with the prestigious 59th annual NHRA Winternationals, Feb. 8-10, at Auto Club Raceway at Pomona in Southern California. 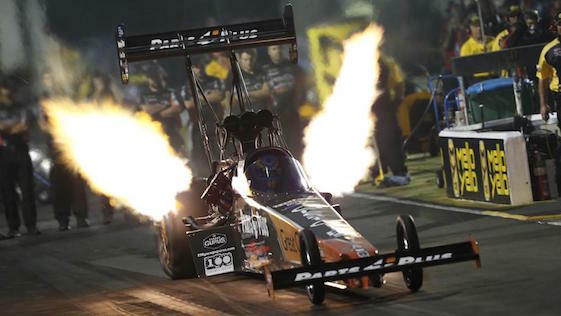 Grubnic tuned Clay Millican to a third-place Top Fuel point finish in 2018, only 23 points behind eight-time world champion Tony Schumacher of Don Schumacher Racing. Brittany Force, the 2017 world champion, finished fifth in the standings led by record-setting world champ Steve Torrence and his Capco Contractors/Torrence Racing team. Force’s 2018 season began at the Winternationals with a wreck that destroyed her dragster. She escaped serious injury and went on to win the SpringNationals in Baytown, Texas, and secured No. 1 qualifiers at the Four-Wide Nationals in Concord, N.C., in the spring and the Carolina Nationals in the fall. Grubnic began his career in NHRA Championship Drag Racing as a Top Fuel driver with Kalitta Motorsports from 2004 through 2014, earning three national event victories, 10 No. 1 qualifiers and a career-best fourth place in the point standings. “Grubby” made the switch from driver to world-class tuner in 2015, developing a combination that transformed Millican and his dragster into a serious championship contender for team-owner Doug Stringer. Meanwhile, JFR President and two-time world champion Robert Hight will continue to drive his Chevrolet Camaro SS. Jimmy Prock returns as crew chief and Chris Cunningham as his assistant. The trio that earned the world title in 2017 won four races in seven final rounds in 2018 en route to finishing second in the point standings. Hight won his first world title for JFR in 2009. J.R. Todd of Kalitta Motorsports drove his Toyota Camry to his first Funny Car world title in 2018 by a margin of 194 points _ nearly 10 rounds of racing _ over runner-up Hight. However, there has not been a repeat champion in Funny Car since John Force won back-to-back titles in 2001-02. Brian Corradi, who joined JFR at the beginning of the 2018 season, and Danny Hood will tune the Chevrolet Camaro SS driven by team-owner and 16-time world champion John Force. “Brute” Force finished a rollercoaster 2018 season with a win at the Mile-High Nationals in Morrison, Colo., and his 34th top-10 point finish in ninth. Corradi and Hood tuned Courtney Force to four victories and 11 poles during her career-best season in 2018. Courtney Force was a top-10-finisher in series points during six of her seven professional seasons. But like sister Ashley Force Hood, Courtney opted to exit the class at the top of her game. In 167 pro races, Courtney racked up 12 victories, was runnerup 17 times and reached the semifinals on another 29 occasions. She was the No. 1 qualifier 28 times, including 11 times during the 2018 season, just two shy of the class record of 13 her father set in 1996. Courtney posted a career-best elapsed time of 3.815-seconds for the 1,000-foot distance and a career-best speed of 338.85 mph. In addition to the fulltime lineup, Generation Next driver Prock will continue the developmental process with the intention of competing during the 2019 season. The 21-year-old son of Jimmy Prock, Austin earned his Fuel Funny Car license in 2018 and will secure his Top Fuel dragster license this season. JFR has not committed to Top Fuel or Funny Car for Prock, who will work with crew chiefs Jon Schaffer and Ronnie Thompson throughout the season.